Muchilot Bhagavathi is the chief goddess of Vaniya community. 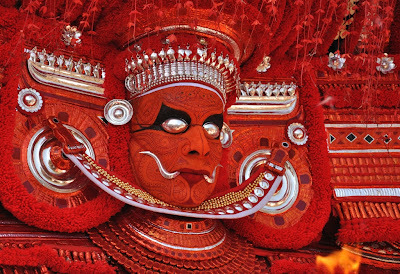 There are quite a few stories about the origin of Muchilot Bhagavathi. The most prominent one is about a Brahmin girl who has born in Maniyott mana (some people say it is Muthillathu Mana). As the kid grew up, she showed outstanding scholastic abilities in all subjects, and had a very good knowledge about the Vedas. When the girl was around twelve years of age, an acquaintance named Pachanambi Thirumeni visited her house and informed about a challenge which was being thrown up by a group of eminent scholars of the time. The challenge was to win an argument against them. Knowing well about the girl’s abilities, Pachanambi thirumeni was quite sure about the outcome of the challenge. People were amazed to see a little girl trying the challenge a group of well-known scholars. The discussions started, and arguments went on for two days. Every question thrown at her was answered very skillfully by the girl. Some scholars started fearing that the girl might pose a big threat for them. Hence they hatched a plan to trap the girl. answers, the scholars began to accuse her saying that she must have experienced both to answer with so much certainty. Under their influence, she was expelled from her own house. This traumatic experience proved too much to bear for the young girl. She left her home and walked towards the north, hungry and tired. She finally reached Karivellur Shiva temple and prayed to lord Shiva standing on burning coals. At the same time a Vaniya was passing by with a pot of oil. She asked him to pour oil on to the coal. He did as requested and the girl disappeared in the ensuing fire. This Brahmin girl become a goddess and descended on earth. She reached Pernijallor and entered Muchilodan Padanayars home and drank water from Muchilodan’s Manikkinar (sacred well). The Goddess assumed the ‘Muchiloden’ family name and asked him to make a temple for her in one of the rooms in his house. Today there are hundreds of muchilot kaavus in North Malabar.